Kevin O'Brien has made history for Ireland. The dreams of 2007 have been eclipsed by this record chase, powered by a record hundred. England's bowling and fielding was shoddy again, but they were backed into a corner and knocked out by the hulking power of Kevin O'Brien.Andrew Strauss, unsurprisingly, looks exhausted but is putting a brave face on it. "We thought we had done a reasonable job with the bat and also with the ball initially. We weren't expecting such an innings from Kevin O'Brien. Our WC dreams are not over yet, we need to set things right soon. Kevin O'Brien played really well and made the most of the powerplay. They deserve the victory, we can't do much but to lick our wounds. We have a couple of niggles, KP and Swann got injured today, hopefully they will be fit for the next game. 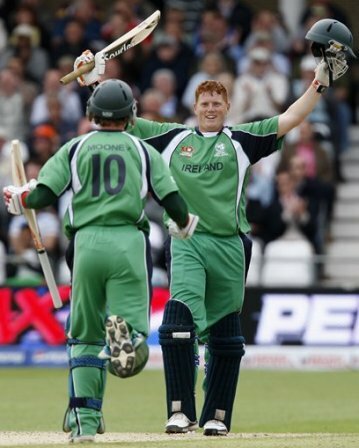 "Kevin O'Brien has treated us to one of the great World Cup innings and is named Man of the Match. And the biggest moment of his life, on the greatest stage, he looks ridiculous with his died purple and bleach-blonde hair. Doubt he'll care though: "Not able to believe it, I am quite speechless. I got a bit of luck and things went my way. If we would have gotten out soon, it would have been a boring game for the supporters and so I decided to chance my arm, it paid off." Congrats to anyone who put him in your Fantasy team. Yet again, it's been a stunner in Bangalore. I'm off for a lie down.